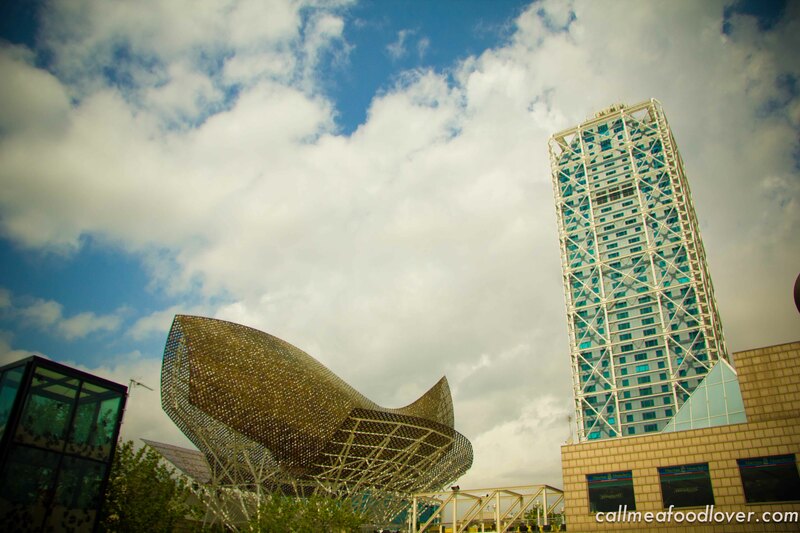 When I planned out my week in Barcelona, I marked Sunday on the schedule to go to Barceloneta to spend the afternoon walking on the beach and working up an appetite for some paella. 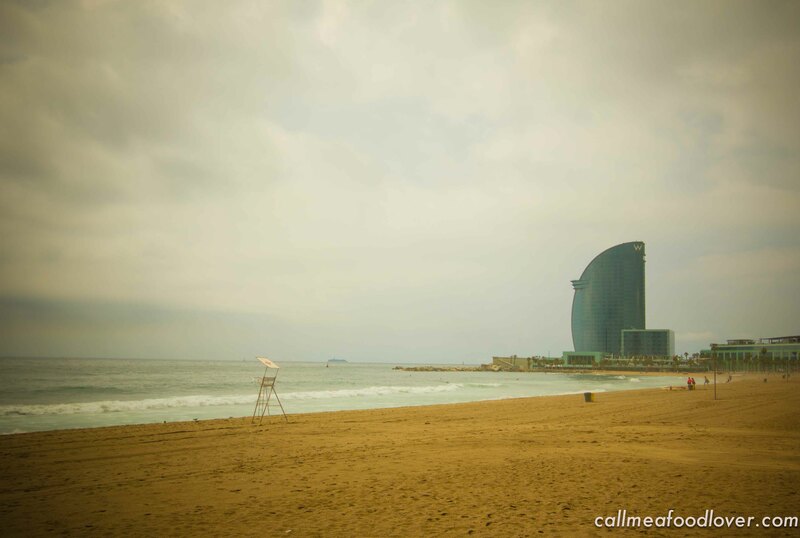 Even though Barcelona is not known for paella, on Sunday, locals go to the beach to have an afternoon meal. Hey if it’s good enough for the locals, then it’s good enough for me! Leading up to our day at the beach, I was worried that I planned poorly as the weather forecast showed Sunday as our only day with rain. I held out hope that the forecast would change but unfortunately it didn’t, or at least that’s what the weather app told me. So I packed for rain and was determined to have a nice day at the beach regardless of the weather. Somewhere along the way, I started thinking that instead of paella, I really wanted to try fideuà, which is like a paella but instead of rice they use small noodles. Seeing as fideuà was more authentically Catalan than paella and something I’d never had before, I was determined to try it. Unfortunately, the restaurant I had booked at, did not serve fideuà, so I found another that did and I thought I’d try to get in early to beat the locals. The sky was grey so I prepared for the rain with a jacket and umbrella in hand. I wasn’t going to let the forecast dampen my spirits for a great meal! When I got to the beach, I was taken aback on how beautiful it was. I know that the beach was beautified for the Barcelona Olympics and it was nice to see the legacy live on. Even with the clouds I was impressed with how long the shoreline was and admired the clean beaches. 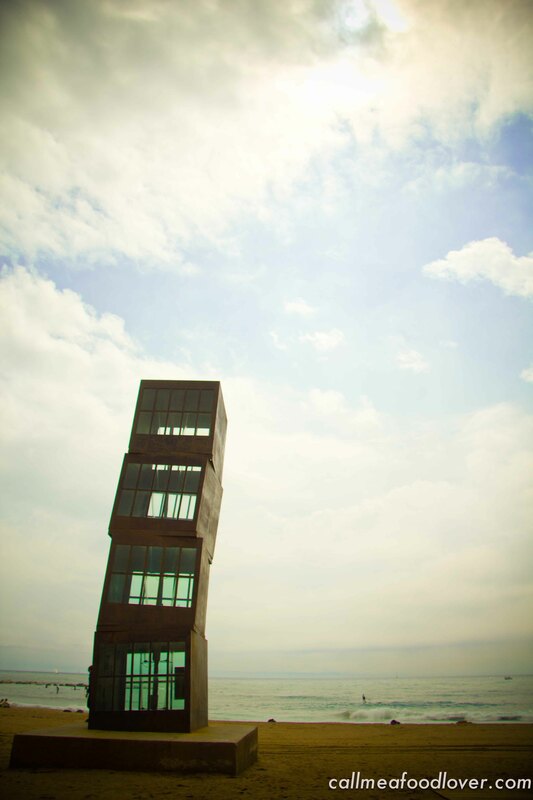 I didn’t plan this beach trip that well and my Barcelona maps didn’t include Barceloneta. I had an address and approximate location of the restaurant Escriba Xiringuito, so I thought I’d be okay. As I walked down the lovely boardwalk, I was excited as the sun started to come out and brighten the day. I enjoyed the pieces of art that were placed along the beach. Long story short, although I was prepared for rain, the sun came out and it turned into a gloriously warm day. I ended up walking in the sun for over 2 hours trying to find Xiringuito d’Escribà along the beach, (where I read it was supposed to be). It was hot and I didn’t have sunscreen on, so I finally gave up. 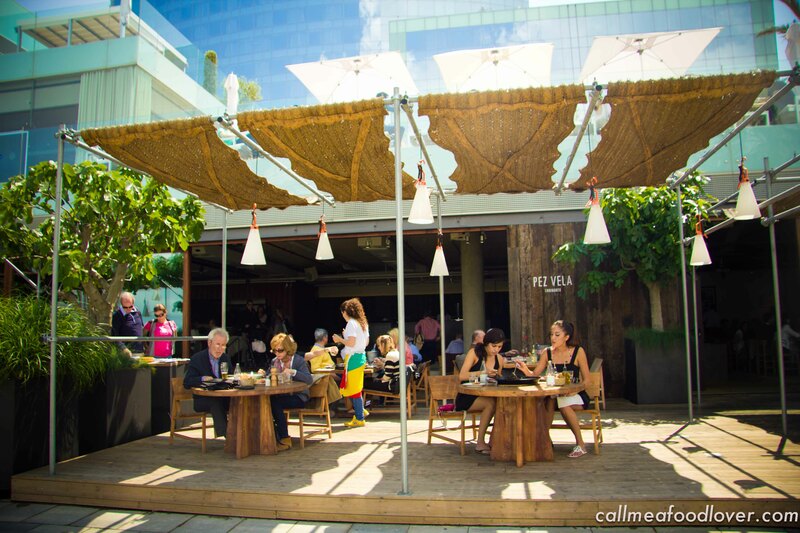 Realizing I never cancelled my original reservation, that became my new plan and I relaxed back into my stroll on the beach to the beautiful Pez Vela located in front of the gigantic W Hotel. 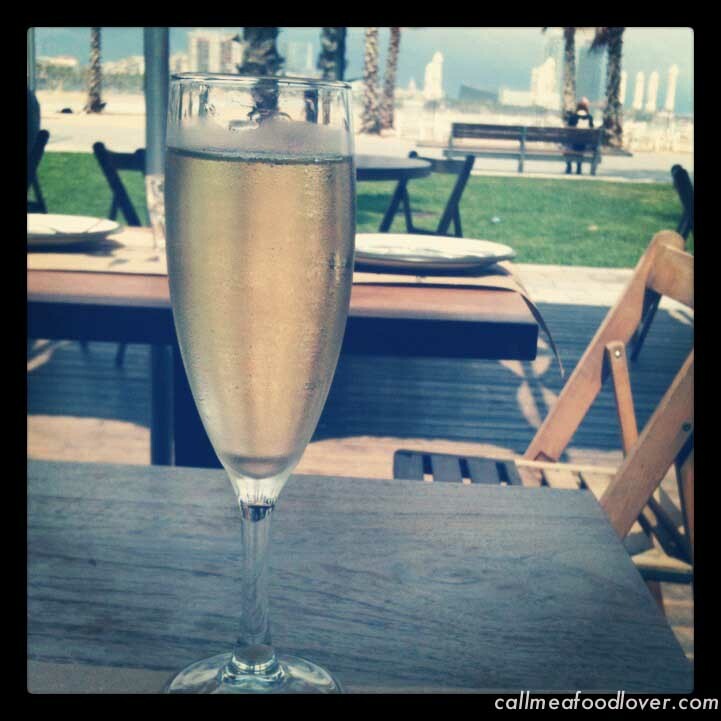 I were seated on their lovely patio and celebrated the moment with a wonderful glass of cava. 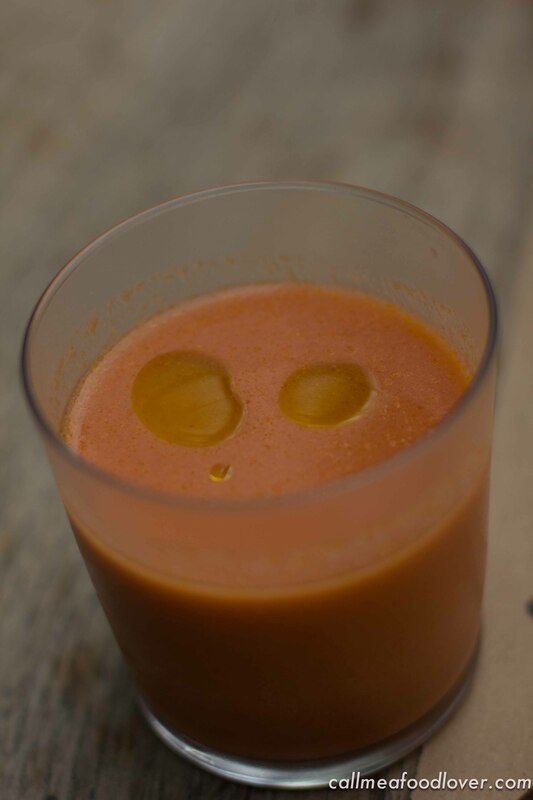 My first, (and only) gazpacho of this trip – so refreshing, I need to learn to have restraint when I make gazpacho as I think simple with great ingredients is the key. 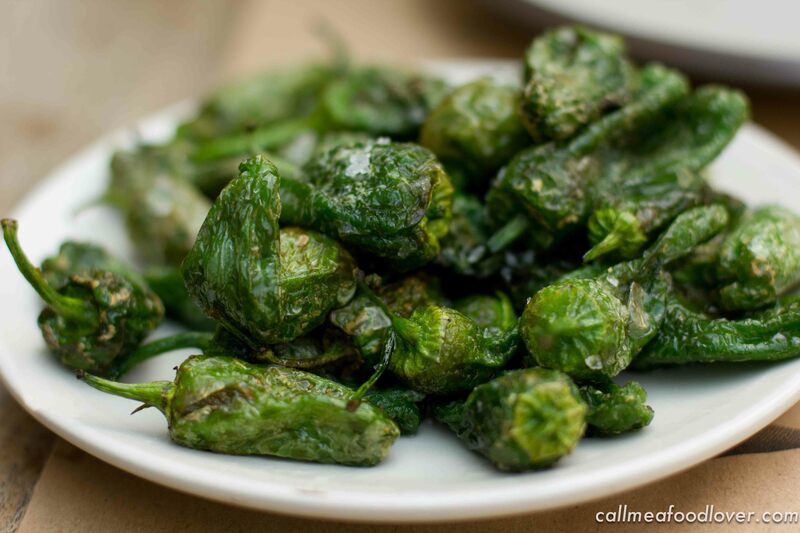 Pimientos de Padrón – plumper than any others I’d tried and finally a few spicy ones! Seafood paella – yes it was as good as it looks. I’m still sad that I never got to sample fideuà, but happy that I experienced this delicious paella because there were a couple of things I’m able to take from it to improve my own paella. 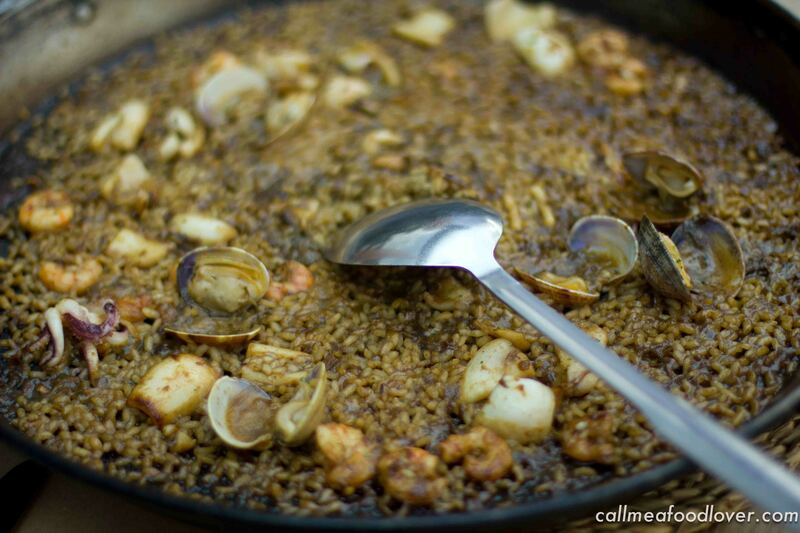 The main point is that the rice is on a very thin layer at the bottom, which really aids in achieving the caramelized crust (socarrat) that is desirable in a paella. The other is that they didn’t fill it full of “stuff” and that this was all about the rice. Can’t wait to make my next paella at home. Actually I packed home some fideuà noodles too, so I can’t wait to try to tackle that dish at home too.